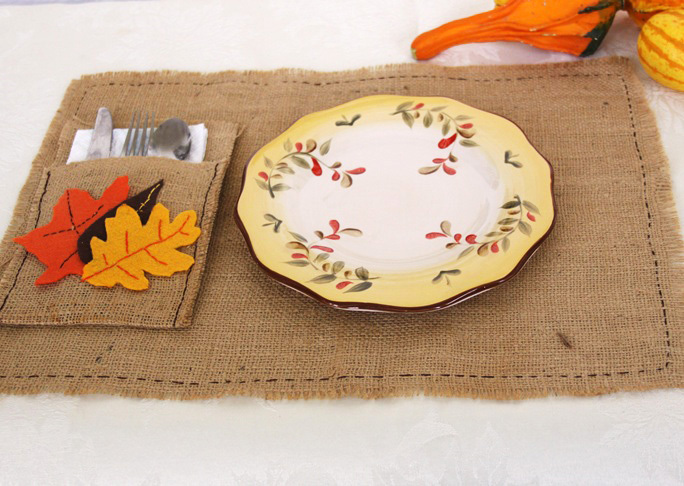 Are you looking for an easy placemat or silverware holder for your Thanksgiving table this year? 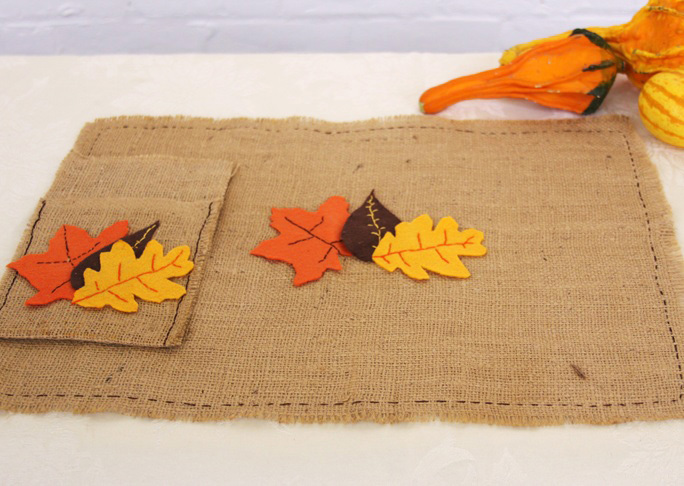 This leaf table setting is perfect for late fall or for your Thanksgiving tablescape. 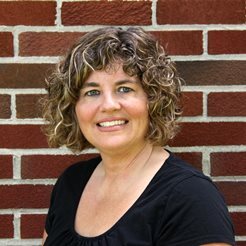 It would also make a wonderful handmade gift idea for the holiday season! 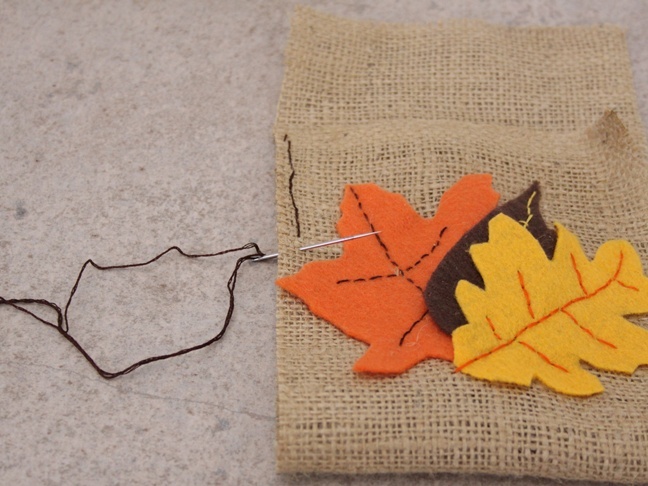 It’s not difficult to make, and you can use any leaf pattern or template to create your leaves. 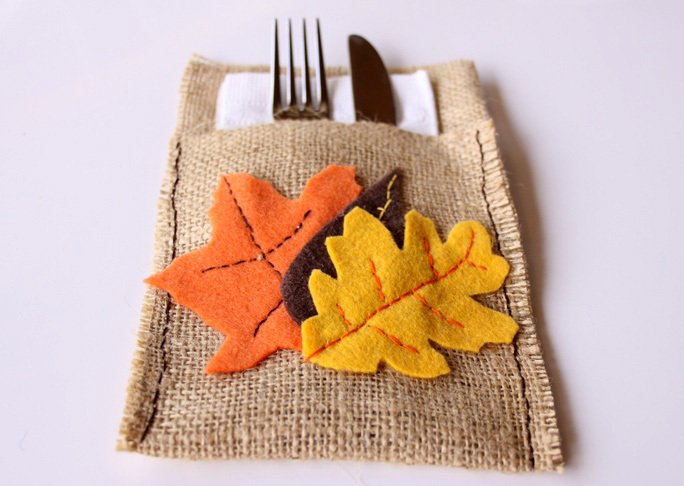 Step 1: For each placemat cut a piece of burlap to 18 by 14 inches and for each silverware holder set cut a strip of burlap 6 by 15 inches long. 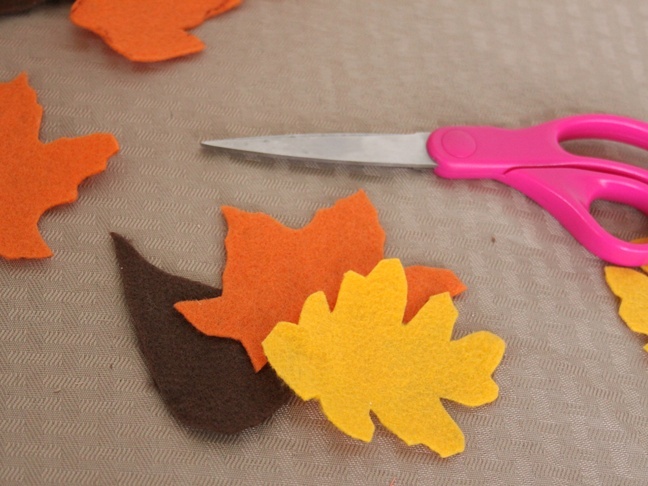 Step 2: Use the leaf templates to cut out 2 leaves from each color of felt, brown, orange, and yellow. 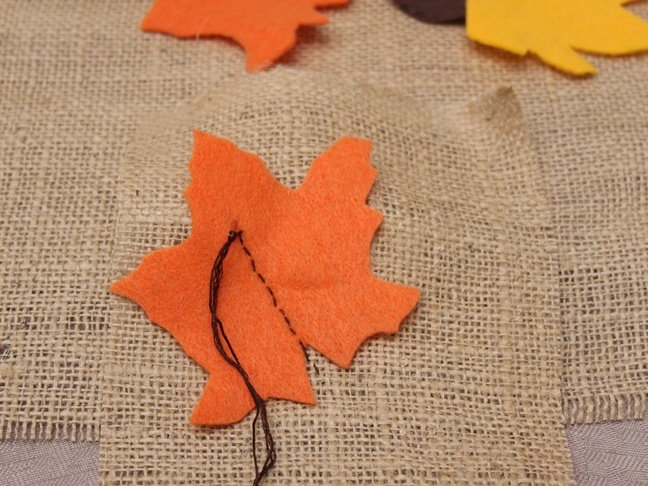 Step 3: Use an embroidery needle and embroidery thread to sew a set of 3 leaves, one of each color to the center of the placemat and another set of 3 leaves to the silverware holder about one inch down from the top of the strip. 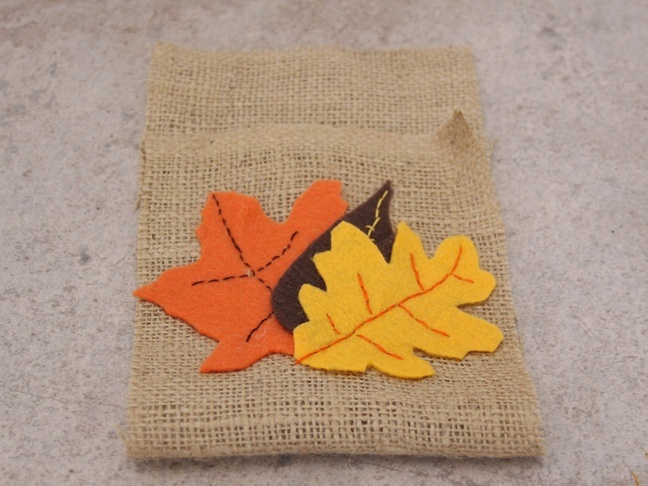 Use the brown embroidery thread to sew on the orange leaf, the yellow embroidery thread to sew on the brown leaf, and the orange embroidery thread to sew on the yellow leaf. 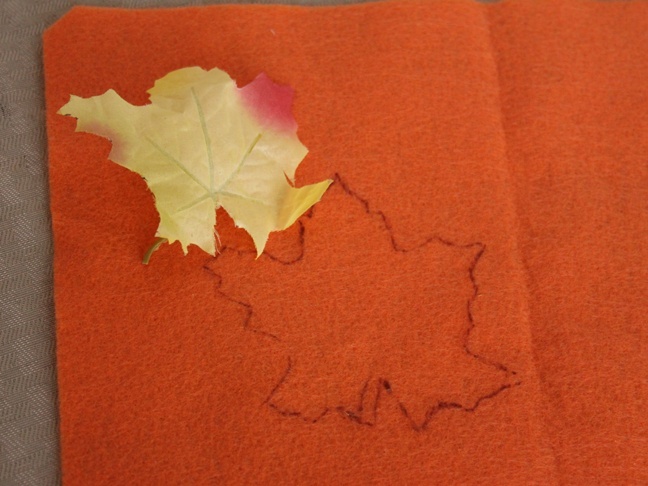 Step 4: Sew on the leaves by hand stitching a strip right up the middle of each leaf, then add “veins” to each leaf off the main center stitches going out about 1/2 to one inch alternating sides about every 1/2 inch all along the center of the leaf. 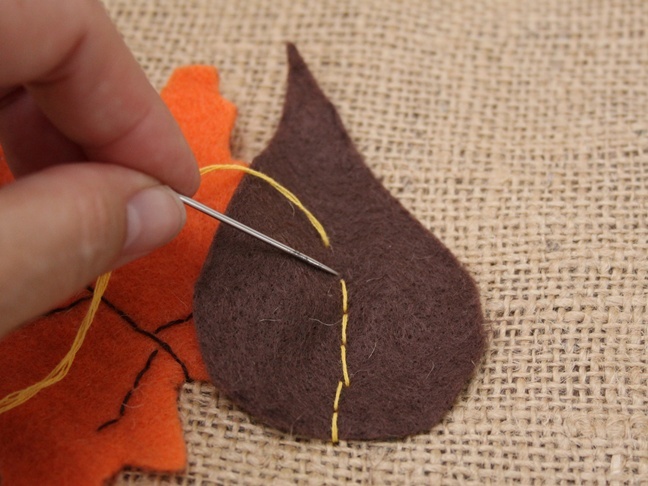 Step 5: Use brown embroidery thread to hand stitch all the way around the outside of the placemat, about 1 inch from the edge to help keep it from unraveling. Step 6: Fold the silverware holder so that the top edge of the side with the leaves on it is about 2 inches below the top edge of the other half. This will give your silverware room to stick out the top above the front of the holder. 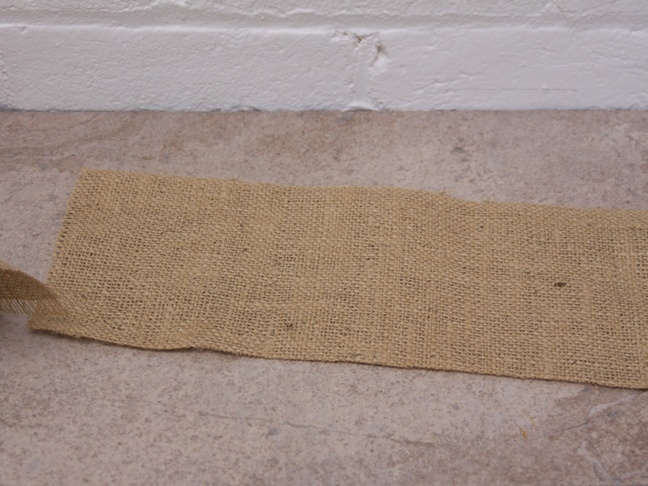 Step 7: Hand stitch along the sides of the silverware holder, about 1/2 inch in with brown embroidery thread.